The 1970s Diet: Happy Father's Day! This is a short and sweet one. 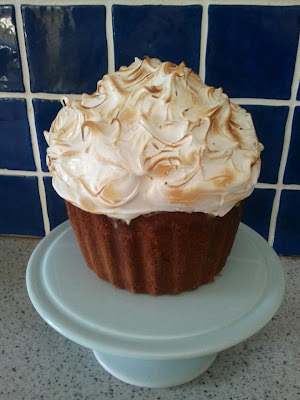 We've had a lovely day, the sun is shining and my lemon meringue giant cupcake with lemon curd and double cream filling is a success! My husband had breakfast in bed and lots of lovely homemade gifts made by the kids. One in particular was very good (even if I do say so myself) - I got the kids to make 3 hand prints on a piece of card and then they wrote (with the exception of buddy) why they think their dad is special. Then I popped it in a frame. Genius. Bow. Some on line website was charging £45.00 for that. So Happy Father's Day to those past and present (my mum and dad are in France holidaying) and lets remember the dad's that don't get to see their kids because the ex is a right biatch! On that note, see you tomorrow for weigh in. I'm feeling like the jubilee weight has come off. I've worked out 4 x this week and hoping to squeeze a 5th one before the day is over. Wow, this cake looks absolutely amazing! How can you be losing weight and cooking like this?! I'd like to see a photo of that cake with a slice cut out - not that I don't believe you about the lemon curd and cream, I just want to see it. Good luck with the weigh in. Glad you liked the prawn cocktails! Hi, could I get the recipe please? Hi, me again. Sorry, if you don't mind sending me the recipe can you pls email it to razzcherry@hotmail.com? Let me take you back..
Republican tendencies or Jubilee Jubilation?